A5 (8T3) 2.7 TDI [2007.06 -. ]. A5 (8T3) 2.7 TDI [2007.09 -. ]. A5 (8T3) 3.0 TDI quattro [2007.06 -. ]. A5 (8T3) 3.0 TDI quattro [2008.03 -. ]. A5 convertible (8F7) 2.7 TDI [2009.03 -. ]. A5 convertible(8F7) 2.7 TDI [2009.05 -. ]. 059 129 086 L / 059129086L. OEM part number A5 Sportback (8TA) 3.0 TDI quattro [2009.09 -. ]. A5 Sportback (8TA) 2.7 TDI [2009.09 -. ]. TOUAREG (7P5) 4.2 V8 TDI [2010.01 -. ]. TOUAREG (7P5) 3.0 V6 TDI [2010.01 -. ]. 059 129 086 K / 059129086K. INTAKE MANIFOLD FLAP ACTUATOR MOTOR AUDI VW 2.7 3.0 4.2 059129086L. A4 (8K2, B8) 2.7 TDI [2007.11 - 2012.03]. A4 (8K2, B8) 3.0 TDI quattro [2007.11 - 2012.03]. A4 (8K2, B8) 3.0 TDI quattro [2008.06 - 2010.05]. AUDI A4 Convertible (8H7, B6, 8HE, B7) 2.7 3.0 TDI 2002-2009. AUDI A6 (4F2, C6) 2.7 3.0 TDI 2004-2011. Audi, VW, Porsche 2.7, 3.0 TDI. AUDI A4 (8EC, B7) 2.7 3.0 TDI 2004-2008. AUDI A8 (4E_) 3.0 TDI 2002-2010. BMW 11617544805. 2003-05 BMW 325i Intake Manifold Runner Adjusting Unit for L6 2.5L (Engine ID M56). 2003 BMW 325Ci Intake Manifold Runner Adjusting Unit for L6 2.5L (Engine ID M56). 2004-06 BMW X3 Intake Manifold Runner Adjusting Unit for L6 3.0L (Engine ID M54). New For BMW 3 5 Air Intake Manifold Adjuster Disa Valve 11617502269 11617544806. BMW 5 (E39) 520 i 09/2000-06/2003 125 170 2171 Saloon. BMW 5 (E39) 525 i 09/2000-06/2003 141 192 2494 Saloon. BMW 3 (E46) 325 i 09/2000-02/2005 141 192 2494 Saloon. 2008-2013 Audi A3 A4 A5 A6 TDI 2.0L; Diesel. 2013-2014 Volkswagen Beetle TDI L4 2.0L; Diesel. 2010-2014 Volkswagen Golf TDI L4 2.0L; Diesel. Audi A3 2.0 tdi 136 100 2008-2012. 2009-2014 Volkswagen Jetta TDI L4 2.0L; Diesel. Audi A4 8EC, B7 2.7 TDI 2005-2008 Motor /Engine: BSG,BPP. Audi A4 8EC, B7 3.0 TDI quattro 2004-2008 Motor /Engine: BKN,ASB. Audi A4 Avant 8ED, B7 2.7 TDI 2005-2008 Motor /Engine: BSG,BPP. 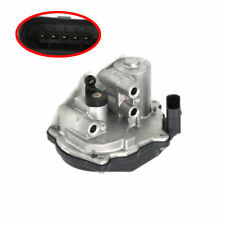 Suitable for: Audi A4 / A6 / A8 / Q5 / Q7 (2.7 / 3.0 TDI Models). VW Touareg / Pheaton (2.7 / 3.0 TDI Models). Part Number: 059129711CK / 059129711CG / 059129711BQ /. Engine Codes: BSG / BPP / BKN / ASB / BMK / BUN / BUG / BKS. BMW - Z4 (E85) - 3.0 i 2003-. BMW - Z3 (E36) - 3.0 2000-2003. BMW - Z3 Coupe (E36) - 3.0 2000-2003. BMW - X5 (E53) - 3.0 i 2000-2006. BMW - X3 (E83) - 3.0 i xDrive 2004-. OEM QUALITY CAR PART. However delays are occasionally inevitable due to unforeseen circumstances. Seat Altea 5P1 1.8 TFSI. Seat Altea XL 5P8 1.8 TFSI. Seat Altea XL 5P8 2.0 TFSI 4x4. Seat Leon 1P1 2.0 TFSI. VW Jetta MK III 2.0 TFSI. VW EOS 1F8 2.0 TFSI. VW Tiguan 5N_ 2.0 TFSI 4motion. Seat Alhambra 710 2.0 TSI. 1 x INLET MANIFOLD REPAIR KIT OE QUALITY 2 YEAR WARRANTY FITS Description Model Year kW HP cc Build AUDI A4 Convertible 2.7 TDI 06.06 - 03.09 132 180 2698 Convertible AUDI A4 Convertible 3.0 TDI quattro 01.06 - 03.09 150 204 2967 Convertible AUDI A4 Convertible 3.0 TDI quattro 01.06 - 03.09 171 233 2967 Convertible AUDI A4 (8EC, B7) 2.7 TDI 11.05 - 06.08 120 163 2698 Saloon AUDI A4 (8EC, B7) 2.7 TDI 01.06 - 06.08 132 180 2698 Saloon AUDI A4 (8EC, B7) 3.0 TDI quattro 11.04 - 06.08 150 204 2967 Saloon AUDI A4 (8EC, B7) 3.0 TDI quattro 01.06 - 06.08 171 233 2967 Saloon AUDI . PEUGEOT 406 (8B) 2.0 HDI 110 RHZ (DW10ATED) 1997 80 4 Saloon 1998-2001. PEUGEOT 406 (8B) 2.0 HDi 110 RHZ (DW10ATED);RHS (DW10ATED) 1997 79 4 Saloon 2001-2004. PEUGEOT 406 (8B) 2.0 HDI 90 RHY (DW10TD) 1997 66 4 Saloon 1999-2004. Audi A4 B8 2.7 TDI 3.0 TDI Engine / Motor: CCLA,CCWB,CGKA,CAMA,CAMB,CGKB,CCWA. Audi A6 C6 2.7 TDI 3.0 TDI Engine / Motor: CDYA,CDYC,CDYB,CANC,CAND,CANB,CANA. BMW 11617522929. BMW 11617579114. BMW 11617560537. BMW 11 61 7 522 929. BMW 11 61 7 579 114. BMW 11 61 7 560 537. VW PHAETON (3D_) (2002/04 - /). AUDI Q7 (4L) (2006/03 - 2015/08). VW TOUAREG (7LA, 7L6, 7L7) (2002/10 - 2010/05). AUDI A8 (4E_) (2002/10 - 2010/07). AUDI A4 Convertible (8H7, B6, 8HE, B7) (2002/04 - 2009/03). AUDI A4 Convertible (8H7, B6, 8HE, B7) 2.7 3.0 TDI 2002-2009. AUDI A8 (4E_) 3.0 TDI 2002-2010. AUDI A6 (4F2, C6) 2.7 3.0 TDI 2004-2011. This product for the Left Right side, 2pcs. AUDI A4 (8EC, B7) 2.7 3.0 TDI 2004-2008. Audi Q7 4L 3.0 TDI 2006-2010 Motor /Engine: BUN,BUG. Note: The Actuator is 4 pins. Audi A6 4F2, C6 2.7 TDI 2004-2011 Motor /Engine: BSG,BPP. Audi A8 4E_ 3.0 TDI quattro 2003-2010 Motor /Engine: BNG,ASB. 2.7 TDI | 3.0 TDI. AUDI VW 2.7 3.0 TDI DIESEL ENGINE SWIRL FLAP MANIFOLD REPAIR KIT SET. 3.0 V6 TDI. A to Z Motor Spares (Wakefield). Buy it Now. However delays are occasionally inevitable due to unforeseen circumstances. A2C59506248 / A2C59506248. A2C59506248 NEW AIR FLAP ACTUATOR AUDI VW TOUAREG. PHAETON 2.7 3.0 A4 A6 Q5 Q7. A4 (8K2, B8) 2.7 TDI [2007.11 - 2012.03]. A4 (8K2, B8) 3.0 TDI quattro [2007.11 - 2012.03]. A4 (8K2, B8) 3.0 TDI quattro [2008.06 - 2010.05]. 1' E81 (02/2006 — 12/2011). 1' E87 (03/2005 — 02/2007). 1' E87 LCI (01/2006 — 06/2011). 3' E90 (02/2004 — 09/2008). 3' E90 LCI (07/2007 — 12/2011). 5' E60 (07/2004 — 02/2007). 5' E60 LCI (11/2005 — 12/2009). Seat Altea [2007-2010]. Seat Altea XL [2007-2018]. Skoda Octavia [2004- 2013]. Skoda Superb [2008-2015]. Skoda Yeti [2009-2018]. Seat Leon [2009-2012]. Audi TT [2008-2014]. Audi A3 [1996-2018]. Engine Code: BSG,BPP,BKN,ASB,BMK,BUN,BUG,BKS. Audi A4 8EC, B7 2.7 TDI 2005-2008 Motor /Engine: BSG,BPP. Audi A4 8EC, B7 3.0 TDI quattro 2004-2008 Motor /Engine: BKN,ASB. AUDI A4 (8EC, B7) 2.7 TDI. INTAKE MANIFOLD. AUDI A4 (8EC, B7) 3.0 TDI quattro. AUDI A4 Avant (8ED, B7) 2.7 TDi. AUDI A4 Avant (8ED, B7) 2.7 TDI. AUDI A4 Avant (8ED, B7) 3.0 TDI quattro. AUDI Q7 (4L) 3.0 TDI quattro. INLET INTAKE MANIFOLD For 2.7 3.0TDI AUDI A4 A6 A8 Q7 VW TOUAREG PHAETON Pair. Note: The Actuator is 4 pins. Audi A4 8EC, B7 2.7 TDI 2005-2008 Motor /Engine: BSG,BPP. Audi A4 8EC, B7 3.0 TDI quattro 2004-2008 Motor /Engine: BKN,ASB. 1 x INTAKE EXHAUST MANIFOLD OE QUALITY 2 YEAR WARRANTY FITS Description Model Year kW HP cc Build CITROËN BERLINGO / BERLINGO FIRST MPV (MF, GJK, GFK) 1.6 HDI 75 07.05 - 12.11 55 75 1560 MPV CITROËN BERLINGO / BERLINGO FIRST MPV (MF, GJK, GFK) 1.6 HDI 90 07.05 - 05.08 66 90 1560 MPV CITROËN BERLINGO / BERLINGO FIRST Box (M_) 1.6 HDI 75 07.05 - 12.11 55 75 1560 Box CITROËN BERLINGO / BERLINGO FIRST Box (M_) 1.6 HDI 90 07.05 - 12.11 66 90 1560 Box CITROËN BERLINGO (B9) 1.6 HDi 90 04.08 - 66 90 1560 MPV CITROËN BERLINGO Box (B9) 1.6 HDi 75 04.08 - 55 75 1560 Box CITROËN BERLINGO Box (B9) 1.6 HDi 110 . For BMW Air Intake Manifold Adjuster Disa Valve --11 61 7 502 269/ 11 61 7 544 806. BMW Z4 (E85) 2.2 i 10/2003-10/2005 125 170 2171 Convertible. BMW Z4 (E85) 2.5 i 02/2003-12/2005 141 192 2494 Convertible. CITROEN BERLINGO 1.6 HDi. CITROEN DISPATCH 1.6 HDi. CITROENC2 1.6 HDi. CITROENC3 1.6 HDi. CITROENC4 1.6 HDi. CITROENC5 1.6 HDi. However delays are occasionally inevitable due to unforeseen circumstances. 1 x BRAND NEW INTAKE MANIFOLD OE QUALITY 2 YEAR WARRANTY FITS AUDI A3 1.8 2.0 TFSI PLEASE LEAVE VEHICLE REGISTRATION NUMBER AFTER PURCHASE TO AVOID ANY DELAYS IN THE DELIVERY PROCESS!. AUDI A4 Convertible (8H7, B6, 8HE, B7) 2.7 3.0 TDI 2002-2009. AUDI A8 (4E_) 3.0 TDI 2002-2010. AUDI A6 (4F2, C6) 2.7 3.0 TDI 2004-2011. AUDI A4 (8EC, B7) 2.7 3.0 TDI 2004-2008. AUDI A4 Avant (8ED, B7) 2.7 3.0 TDI 2004-2008. LEFT 059129711& RIGHT 059129712 Intake Manifold ForAUDI A4 Q7 VW PORSCHE 2.7 3.0. AUDI A4 (8EC, B7) 2.7 TDI. AUDI A4 (8EC, B7) 3.0 TDI quattro. AUDI A4 Avant (8ED, B7) 2.7 TDi. AUDI A4 Avant (8ED, B7) 2.7 TDI. AUDI A4 Avant (8ED, B7) 3.0 TDI quattro. AUDI A4 Convertible (8H7, B6, 8HE, B7) 2.7 TDI. 11617544806 For BMW 3 Series E46 325i 320Ci E39 520i 525i DISA Valve. BMW 11617544806. BMW 5 Touring (E61) 525 i 06/2004-12/2010 141 192 2494 Estate. BMW 5 (E60) 520 i 07/2003-03/2010 125 170 2171 Saloon. Intake Manifold Intake Manifold FOR AUDI A4 A5 Q7 VW TOUAREG PORSCHE 2.7 3.0TDI.